She is 12 ft in length. The transom height was increased to 21" and reinforced, additional knees added along with sheet aluminum. The longitudinals are mahogany, decking and bottom are constructed with marine 5 ply, cowling behind the seats 3/4" x 1/4" cedar strips (fiberglased). The entire exterior area has been fiberglased. A 12 gal gas tank was installed in the bow area. She has single cable steering. Full instrumentation: Volt meter, gas guage, speedometer, and tach. She is powered by a new 50 hp Yamaha. All that has to to be done to complete this project is painting. Will send additional pictures when she is in the water. 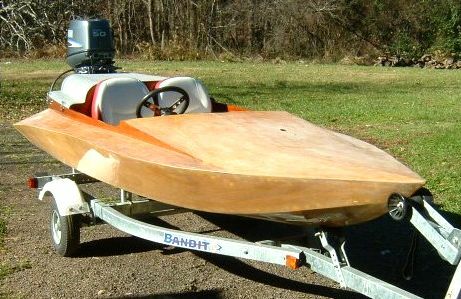 PS: Im a 74 year old senior and building this boat has really helped make 04 fun year! Project started 1-04. It's amazing how sea worthy this little vessel is.